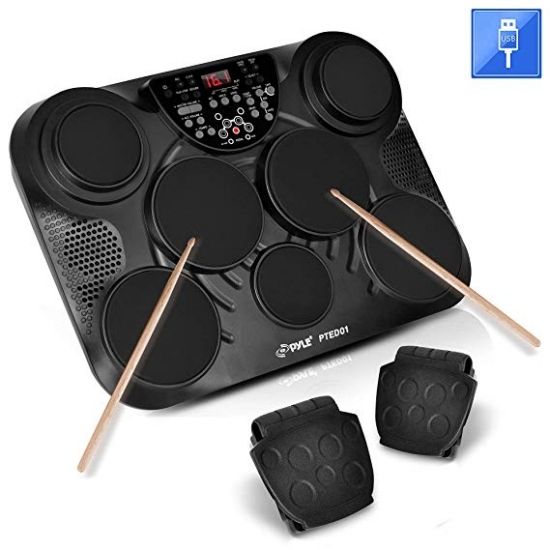 I received the PTED01 Portable Digital Drum as a gift because I really wanted to learn how to play the drums, but I live in an environment where an acoustic kit would be too loud. This product does everything I would want it to do as a beginner drummer, and I was over all very impressed with it. The response time is great, no lag when you hit the pads. The drums are very dynamic too, which I was not expecting. I love that in addition to the preset kits you can also create your own kit, making it very flexible to get the sounds you want. It does take some getting used to, definitely not like playing an acoustic kit, but such is the case with almost every electronic drum set. This product works great as a midi controller, though there is no way to turn the sounds off on the drums if you are trying to hear sounds from your Sound Engine (which this device does not have the ability to act as through your DAW), so you'll have to turn the volume all the way down on the Digital Drum itself in order to only hear the sound coming from your DAW. It also does not come with a cord to connect to your computer to be used as a controller, but if you have ever bought a midi controller in the past, chances are you will already have the needed connection. What is the max power wattage of the built in speaker? I'd love to upgrade the foot pedals to something like a Roland KT-9. Will triggers like this work with the drum pad? I do not have that specification available to me, because I don't have any information on the Roland KT-9. If the plug connectors are the same, and it works as a momentary switch, it should work. But I cannot guarantee. what headphones should I buy ? Any standard stereo headphones should work. what headset goes with this set? Any stereo headphones with a 3.55 mm plug.